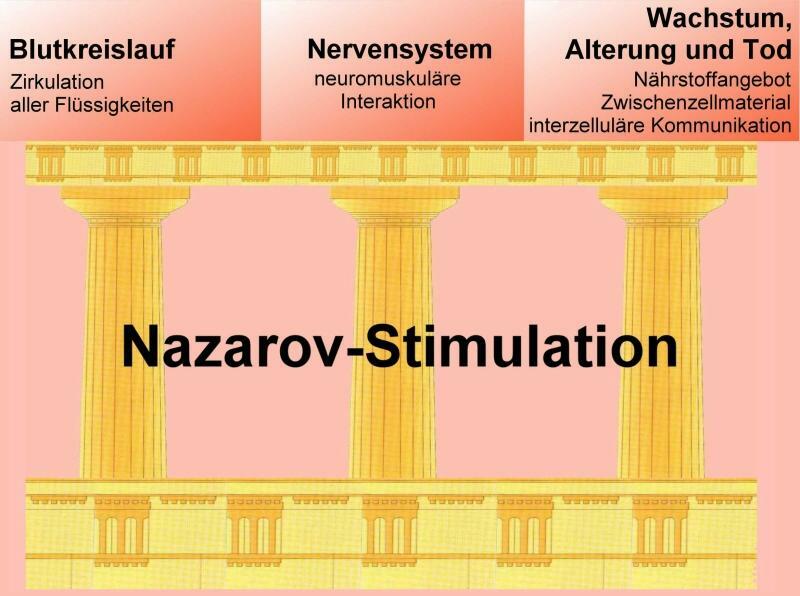 Nazarov-Stimulation is the physiological reproduction of natural muscle work. That means, muscles are brought in the same longitudinal oscillation, as it develops during any indepent maximum strain automatically. This natural/biological vibration is recreated by the Nazarov-Stimulation without any own physical effort on a purely mechanical way. For that reason it was also called BioMechanical Stimulation (BMS) by its discoverer, Professor Dr.habil.Vladimir T.Nazarov, in 1974. BMS is a “concentrated training” for the entire musculature and all other body fabric, which exceeds the possibilities of wilfully activity far. All well-known, various positive effects of physical education are with BMS substantially faster reached and exceeded in comparison with classical training and conventional methods (BMS is 10-100fold more effective). In contrast to all well-known vibration methods before, the BMS acts as follows: (a) transfers oscillations into longitudinal direction to the muscle fiber, (b) to strained or lengthened musculature and is (c) exactly adjusted in amplitude and frequency to the muscle's natural frequency. The muscle is set into mechanical resonance, whereat the natural frequency is dependent on its individual hardness, mass and length. However, today the term BioMechanical Stimulation is commonly used for other procedures too, which are not similar to the original BMS-method at all. For that reason the original method is distinguished by the name of the discoverer: Nazarov-Stimulation ®. What's the goal of the Nazarov-Stimulation? BMS increases the power, stamina, flexibilty and coordination. With BMS any muscle can be activated. Apart from the training attraction thereby above all the circulation (=nutrients supply) in this muscle and all organs connected with it increases. In particular BMS can (like gymnastics, stretching or massage) release our tissues from unnecessary intermediate cell material, whose lifelong growth limits gradually each liquid circulation in the organism - decreasing the cell supply and leading at the end to a loss of power and elasticity. BMS intensifies the fundamental living-processes, which are all dependent on movement and muscle work and prevents thereby of many common and usual symptoms of old age.